It's the year 1912. Private investigator Booker DeWitt finds himself neck-deep in debt, and sees his grand opportunity when a mysterious man suddenly appears on his doorstep and tells him to ”bring them the girl and wipe away the debt”. Booker heads to the colossal sky-borne city of Columbia to look for this particular girl, Elizabeth, who's been held prisoner by a religious cult led by one Father Zachary Comstock for her whole life. As if it wouldn't be enough that one's come to take their chosen one away, Booker is almost immediately recognized as a false prophet who has to die. Prepare for take-off, we're in the sky now – welcome to BioShock Infinite. ”You've played one FPS, you've played them all.” This is what me and my ex-girlfriend perfectly agreed on. Yet, when BioShock Infinite came out, she was ecstatic and after a week, claimed to have spent every waking moment of her short spare time on the game. For the longest time, I thought she had just simply sold out. Even after all the awards, all the reviews, all the nominations. Even after about a dozen friends tried to force my hand to finally take on this ”perfect” game – including friends that weren't that keen on the genre and guys who hadn't played the earlier games at all. Well, the obvious question here is: what makes BioShock Infinite so special in this genre? As a matter of fact, the two BioShock games that came before already answered that question. 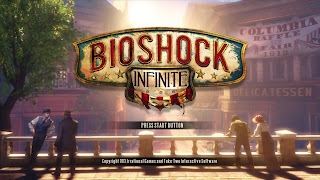 There's a familiarity about BioShock Infinite; it's very different in a lot of ways, but turns into a bonafide BioShock gradually, on the go. The storyline, and how it finally fits into this crazy universe, is more important and better than ever. That means the game slows down a bit every now and then, but after the admittedly strange and quite boring start, and after getting accustomed to the simplified gameplay, you shouldn't care anymore. There's a lot to love about BioShock Infinite, and I sincerely can't imagine someone not seeing anything good in it. As I said, the game starts out very slow, and takes about two to three hours to really begin. I consider finding Elizabeth the true beginning of the game, everything prior is just tutorial to the very basics, to prepare you for the real thing. Well, what's strange is that there is no ”real thing”; Elizabeth does just fine on her own, as she's immune to both friendly and enemy fire. What separates the earlier gunfights from the later ones with Elizabeth in tow, is that she's simply there. When it comes to other stuff besides ferocious gun- and Vigor (earlier Plasmid tech) play, having Elizabeth around is a true bliss. She's a great character, I love her (Courtnee Draper) and Booker's (the almighty Troy Baker) constant, very realistic exchange. Elizabeth can also pick any lock; she uses her hairpin to bypass the locks you need to open to make progress in the story, but there are plenty of secret rooms and safes all around Columbia which need proper lockpicks to be cracked. She can also summon "tears"; fully explaining them would need a lot of text, so let's just say she can summon random things that aren't actually there to your aid in combat, such as stashes of medical kits or even gun turrets. All forms of hacking are out of the question, there is only the Possession Vigor which you can use to possess both man and machine – it also works for a limited time only. Machines get ultra-hostile once they break free of the spell, while the human enemies are so badly traumatized by the possession and what they've done under its influence, that they actually blow their own heads off. Awesome beyond compare – it also looks awesome beyond compare. 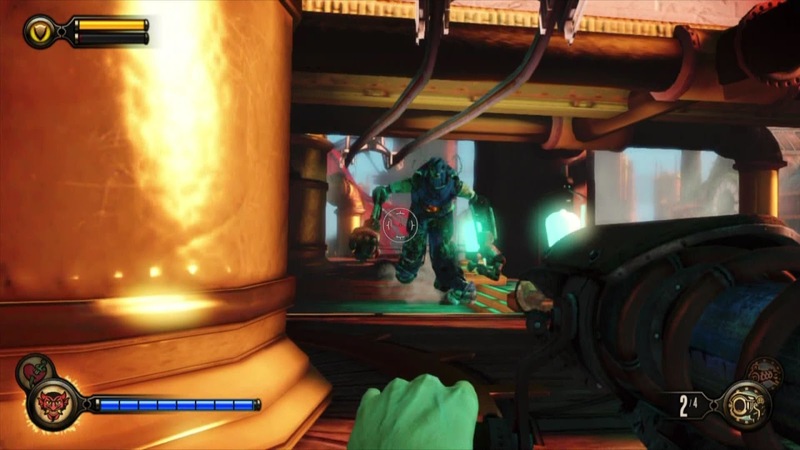 Though it might not look like it at first, BioShock Infinite is a very brutal game. Not only by the amount of blood that is spilled, it also probes oft-tabooed subjects such as racism and slavery, and some of the moral decisions you're forced to make during the game are linked to these underlying themes. But, lest I spoil some of the most disturbing scenes in the game, let's talk about the graphic violence. Your basic melée weapon, the Sky-Hook, is probably one of the best tools a gamer could ever imagine having in any sort of action game. The Sky-Hook can be used to travel the rollercoaster-like ”roads” of Columbia, called Sky-Lines. It should be clear by now that the world of Columbia is a lot more open and wide than that of Rapture, the Sky-Lines make it possible to travel from level to level fast and comfortably. You can shoot any weapon while hooked on a Sky-Line, and even pull off fancy air assassinations with the Hook itself. The Sky-Hook is such an excellent melée weapon that it's ALMOST up to your own preference whether you want to wield the Hook or the big guns in any casual fight sequence. You can use it to decapitate folks, impale their necks, slit their throats, even to drill holes in their skulls. In very close view, at that. Never leave home without the Sky-Hook. The Handyman most certainly can. And will. You can only carry two ranged weapons at a time, which makes sense – there's plenty of 'em, and plenty of different versions of the same weapons. The ”upgraded” versions work better in some combat situations, the earlier ones work better in some other combat situations. Advanced stuff like projectile type, rate of fire or clip size are actually keys to success in some of the more challenging gunfights which feature almost every goon on the roster. On top of the cult and the anarchists of Columbia, there are also colossal robots modelled after former U.S. Presidents – called the Patriots – some teleporting guys, some burning guys, and finally, the Handymen, who are this world's equivalent to Big Daddies (size) and Big Sisters (speed and strength). Trust me, Hard Mode wasn't fun. I hear 1999 Mode – Levine's little tribute to his major debut System Shock 2 – is much, much worse. The selection of Vigors has changed some, mostly in name only. There are a few new tricks to unleash on unsuspecting hordes of enemies, as well as the classic Possession which I already mentioned, and Devil's Kiss, Booker's equivalent to Jack and Delta's Incinerate. 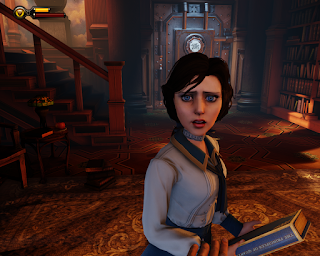 As I also said, BioShock Infinite gets closer to BioShock on the go. Whether it's the best game in the franchise or not, I was still asking myself that question when I started writing this review. Now that I'm done reminiscing about all its best moments right up 'til the great ending of the base game, I've reached my final verdict. 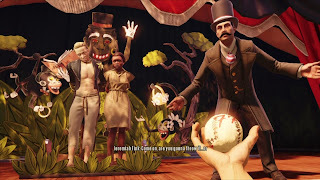 The even crazier world and characters, the easy access to core gameplay, the gameplay's amazing flow, and the fantastic storyline that's supported by top notch voiceover work and great music – stay tuned for Baker and Draper's duet in the end credits – make BioShock Infinite the most balanced, the finest game in the BioShock franchise. It's a slow hook, but a definite one. Go ahead and play BioShock Infinite. You will NOT be disappointed. 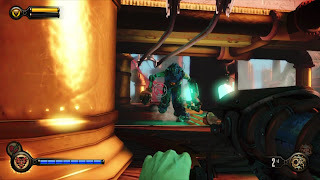 And, if it's not enough for you, I can also easily recommend the Burial at Sea DLC, which places our two heroes in 1958 Rapture for old times' sake, and wraps things up quite nicely for this whole franchise. 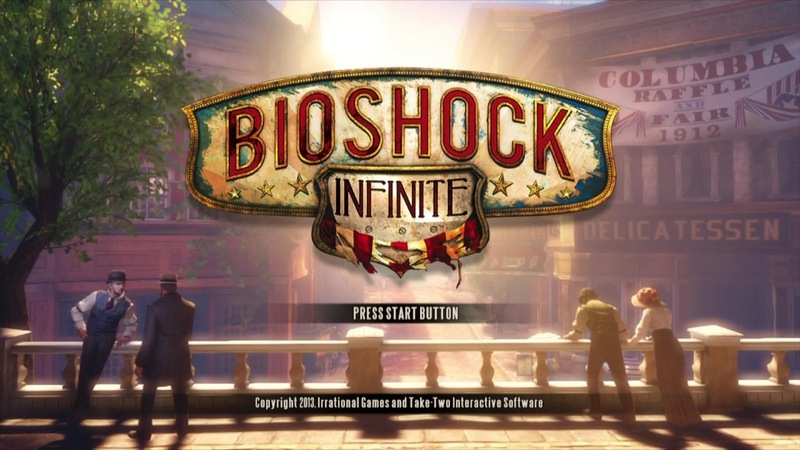 Although the BioShock series will most likely not continue, I'm eagerly waiting for Ken Levine's next masterpiece.